Could coworking in empty restaurants be London’s next craze? If you have even a passing interest in the restaurant industry, you’re probably already aware that times are tough. Profits for casual dining are down while rent on premises, especially in major cities, remains at a steady high. The solution? Coworking. Of course. Crave Fishbar in New York’s Upper West Side is an early adopter. The dinner service doesn’t begin until 5pm, so at 8:30am sharp it throws opens its doors to a cohort of coworkers and provides them tea and coffee on tap. Like this? Read We know coworking works, is co-living the next big trend? Crave does not work alone. It runs its coworking service in partnership with a company called Spacious, itself a startup, that transforms restaurant dining space into a de facto shared office, connecting up WiFi, adding additional plug sockets and providing the refreshments. A Spacious host checks members in and out and ensure the place is left tidy, and texts alert coworkers when it is time to leave. Spacious bills itself as a cheaper alternative to conventional coworking offices – and indeed, at $129 a month (£99) or $99 per month with a year-long subscription (that’s a cash-flow-friendly £76) it genuinely is. There are none of the frills associated with the more well known coworking spaces but for anyone looking to get out of the house and work in a professional quiet space, it’s an appealing offer. In addition to a working hub in the front area, Crave provides a quiet zone at the back complete with white noise machine. Could this US model translate across the pond? The figures certainly add up (Spacious confirmed a $9.1 million funding round earlier this year) and the restaurants get a cut of members’ fees to help with booming, mid-town rents. 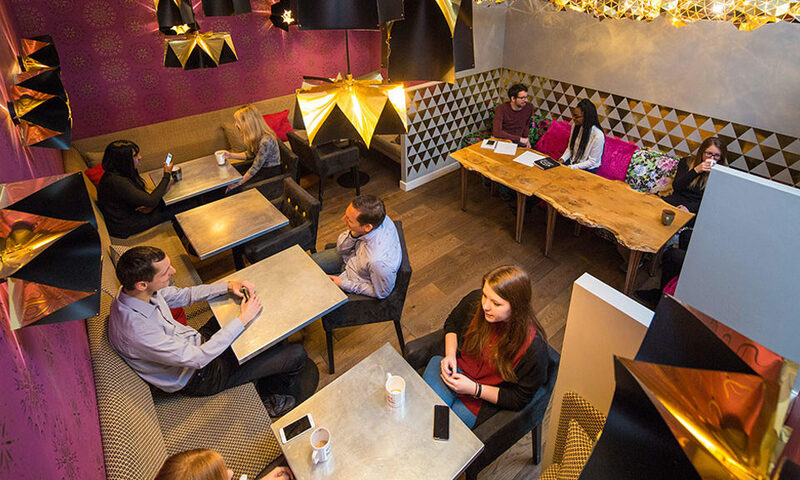 Coworking is rapidly growing in popularity and demand in the UK, too – while the restaurant is, as mentioned, ailing. In theory, it is the perfect match. With Spacious’ empty eatery model, the working day for coworkers finishes when the restaurant’s begins – even if that is at 5pm, or earlier, and even if you’ve finished your work or not. Most members are happy to forego the free perks (snacks, end-of-play beers, although some Spacious venues serve lunch) but reports suggest that there is little interaction between coworkers, and atmosphere can be lacking in an empty restaurant at 11am. And yet, there is something very… ‘coworking’ about the Spacious model. One business helping another; lateral thinking to solve a problem; creating a community out of an otherwise disused space… these are the values coworking was built on, and the principles those to which many coworkers subscribe. With thousands of restaurants throughout London, and rent not looking to dip any time soon, it’s surely a matter of time before our lunch and our laptops collide.